Vieques is not a cruise-boat metropolis like some other islands in the Caribbean. We have limited options for car and truck rentals, and during busy times none may be available. It’s not too inconvenient to get to dinner and back by taxi, but if you want to explore the beaches like we do, it’s best to rent an off-road capable vehicle. We have made this easy for our guests at The Pink House by keeping a late-model at the house that you can rent if you wish. Our vehicle (which, accept our apologies, is not pink) is a four-door Toyota Tacoma PreRunner SR5. Equipped with an automatic transmission, great air conditioning, and even a back-up camera, it’s a great way to get to beaches and dinner. Regardless of how long you are staying with us, the vehicle is available for any period of three or more consecutive days. 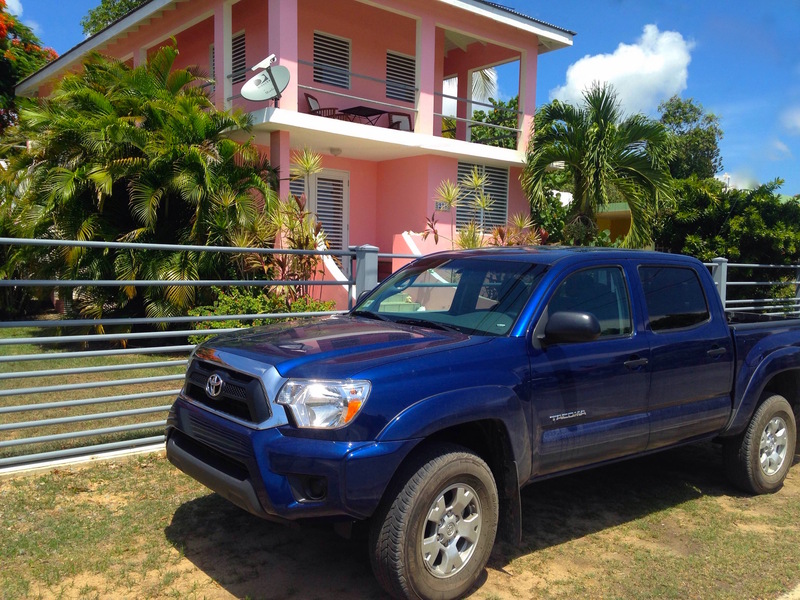 Please email us at PinkHouseVieques@gmail.com to reserve the vehicle for your stay.